I read this article and found it very interesting, thought it might be something for you. 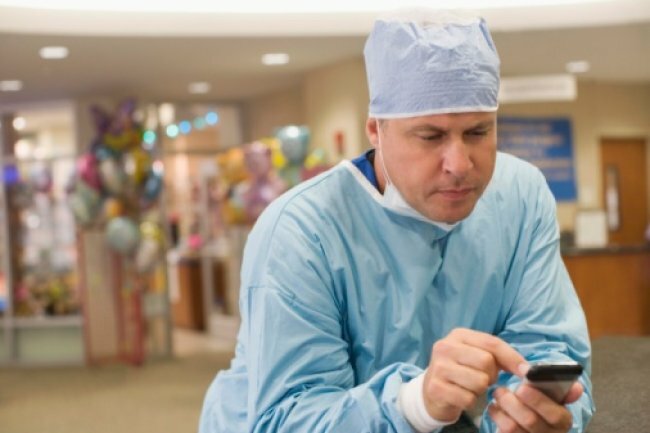 The article is called Secure Text Messaging: 10 Questions Hospitals Should Ask Their Vendors and is located at https://hitconsultant.net/2014/01/29/secure-text-messaging-10-questions-hospitals-ask-vendors/. Healthcare systems are growing and many physicians are now working in bigger organizations. They have to meet new physicians that they previously did not work with. They are introduced to new facilities and a new working environment. The mobile platform is an excellent way to bring a large organization together, align physicians and give visibility to the organization. Must Have: The ability to brand the offering with the organization’s logo, organize physician lists by specialty or department, and provide the organization’s directories and other important content. Ask: Can your product categorize users by specialty or departments on your mobile app? Does your system allow administrators and super-users that have high-level privileges? Will I have the ability to run reporting from your software? The contact list for healthcare messaging apps has to be controlled. Everyone in an organization cannot have easy access to messaging physicians. When this overload happens, messages are ignored, causing a poor experience and defeating the purpose of a professional messaging app. Must Have: The system must have the ability to control contact lists at the provider and administrative level. Each department should be able to be closed or open depending on preferences. Physicians should also be able to give out their app ID to nurses or others and add contacts as needed. Ask: Can a physician control their contact list? Can the healthcare organization control the contact list? Can physicians contact any physician they want? Can you give us suggestions on how to set it up? A true professional messaging company has messages coming at all times of the night through multiple time zones. No matter how great a product, some people will need help with the technology. Must Have: A phone number and e-mail address inside the application and on the website so that users can contact customer service and be helped in a timely manner (immediately in most cases, but within 15 minutes 24 hours, 7 days a week). The company must also have a strong service agreement. Ask: Do you have a 24/7 toll free number? Do you have a 24/7 e-mail address? Can this be accessed from both the web and mobile app? Can you send me your service level agreement? To have a comprehensive messaging solution, a messaging app has to be able to take care of all scenarios for the physician. Call centers frequently text physicians, which is not secure, and many also page physicians, which makes them carry two devices-an unnecessary inconvenience. Physicians receive messages from other physicians, nurses, staff members, answering services and call centers. Must Have: A call center integration solution that connects the mobile app and communication system to any known call center or answering service software. Some of the most common ways to achieve this are WCTP, TAP and SNPP protocols. When handling communication for large healthcare organizations, experience is key. There are many small things that have to be done right. From a controlled rollout with strong customer support to understanding how healthcare providers work and want to communicate and use the product. It can be a real challenge to put 2,000 users on a mobile app for secure communication. Must Have: A company that has rolled out large organizations on secure communication platforms. They must also understand and be able to provide provisioning so that the system works seamlessly. An example would be integrating with LDAP. Ask: Do you service organizations with more than 500 users? Can you send references? What is your large organization rollout strategy? Can you have someone onsite for the rollout? Do you have training material, including videos? Mobile apps are becoming an integral part of healthcare. Secure communication is the core feature, but there is much more to offer. Mobile apps that offer secure communication have an opportunity to provide unique and beneficial mobile features to customers. Must Have: A company that has healthcare-specific features in the pipeline. These features must be innovative and created to improve a physician’s workflow and productivity. Features that improve patient care are the most important add on features. A company that will continue to innovate will be important as your mHealth strategy evolves. Ask: What features are in your pipeline? How often do you release new features? Who selects what features to develop? We have done extensive research on secure texting and messaging platforms. Well-established, healthcare-exclusive companies such as Doc Halo provide most, if not all of these features. Some non-healthcare exclusive messaging companies such as Tiger Text also have many of the above mentioned. The key is to interview these companies and others to make an informed decision before purchasing.